Watch the Video Yes. Dedicated Nexternal Account Manager. Unlimited support. No. Support Forums. Watch the Video Yes. Mobile Friendly Catalog & Checkout. No. Watch the Video Yes. Complete drop-ship automation capabilities. Yes. Watch the Video Yes. Add-on module. 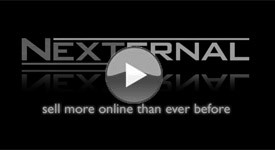 Watch the Video 10 XML Tools Available. No XML tools included. Some XML import add-ons available for purchase. Watch the Video Yes. Module. Software Updates Free and automatic. Merchant's responsibility to install. Certain modules built to certain releases, so may cause incompatibility. Marketplace Feeds Automated - run daily. (Google Merchant Center, Shopzilla, Pricegrabber, etc.) Manual. Multiple Ship To Customers can place one order and ship items to multiple locations. UberCart does not support multiple ship to locations. Supports In Store Pickup Yes. Add On Module. Automated Review Reminders Yes. No. Inventory Kits/Product Bundles Supported. Supported. Load Balancing Yes. Nexternal uses a large network of servers. No. Software sites on one server. McAfee Secure Badge Yes. Nexternal's network is scanned daily. Not included. Security Certificate Included/Installed. Must purchase and install. Reliability Nexternal hosts and maintains the application with 24/7 monitoring. UberCart is hosted by a third party. Reliability varies. No built in monitoring. Back In Stock Notifications Yes. Automatically emails customer when backordered products are instock. Add-on Module. The Ubercart comparison information on this page was believed to be correct as of . Information was collected from Ubercart's website (www.ubercart.org) in order to compare it to Nexternal's shopping cart application. To report an error or discrepancy, please email .